Last week I was lucky enough to be given the change to interview the wonderful Kevin McCloud of Grand Designs fame. To say I was a little nervous was an understatement, and I’m not really sure what Kevin made of me. However, this isn’t about me, it’s about the wonderful Kevin! So do read on to hear what he has to say about all things Grand Designs, including his career and a few behind the scenes snippets. And if you’re interested in going along to Grand Designs Live in May, you might like to enter the giveaway to win a pair of tickets too. Q: You have a design and architecture background, but I’m intrigued to find out how you became involved in TV work and Grand Designs in the first place? Was it a natural progression, or completely out of the blue? Kevin said that it had all been an amalgamation of events that led to him appearing on Grand Designs back in 1999. He hadn’t planned a career in TV and had concentrated on his design work, firstly working as a theatre designer and then retail design. In the 80’s he set up a very successful design studio which lasted for over 20 years, where they had a team of 25 staff and even did their own glass blowing and had a forge. After having written a few successful book on lighting and decoration, he was approached to work on TV, which he did for several years alongside running his business. In 2002, he sold up though, and worked solely on his tv career. But something was missing; it wasn’t enough and so he developed HAB, a housing development consortium which has now led to his being honoured with an MBE this year. Hab was established by the writer, designer and broadcaster Kevin McCloud. It stands for Happiness Architecture Beauty. We build houses that make people happy; that keep people warm in winter and cool in summer and generally comfortable and cheerful all year round. We work with brilliant architects and landscape architects to make places that look great and work well, and have lots of outdoor space for people to play, chat, lie in the sun, throw a good party, grow their own food. Q: Grand Designs has been on our screens since 1999, I was wondering how featured projects have changed throughout that time? Has the more recent economic downturn affected the types of projects/builds that are put forward on the show? This question led more to a fascinating discussion about the changes within TV, as well as the obvious changes within the economy and property development. Back in its infancy, Grand Designs was groundbreaking. Do you remember shows like Changing Rooms? Well they were all about mocking design really, and often created havoc for the homeowner. Grand Designs was, and has always been about celebrating design and the risks that homeowners take. Participants, or Grand Designers were initially skeptical about the show and how they would be portrayed, but it wasn’t long before they were won over. Running a documentary like this for an hour was different too, but look at how many other ‘makeover’ shows are now following the same format! Q: How do you go about selecting projects for each series? As you might expect, there’s a lot of due diligence that goes on in the background, checking out things like planning permission before they get to the shortlist. Researchers put together a short film of all the proposed developments, which Kevin and the Grand Design production team watch, in order to make their final decisions. We went on to talk about the team behind Grand Designs, some of whom have left to have a family and now returned. It seems like a very tight unit indeed, which I guess is reflected in the quality of the show. Q: Is there any one particular project or build that stands out in your memory from the programme? If so, why? And do you have a favourite? Ok, so maybe a little bit of an obvious question, but I was interested to know if, firstly Kevin remembered the builds, and secondly, what he might choose. He actually referenced the project on the Isle of Skye, built by Rebecca and Indi, in such incredible surroundings as one that had stayed with him. Architecture is as much about place, as it is about people. Q: I was intrigued to see how moved he was by the man who built the woodman’s cottage (the man who’d lived in a tent for ten years) which is not what springs to mind when I think of ‘great’ architecture. Is it the architecture of a building or the passion behind its creation that is more significant? A great question that gave Kevin the opportunity to show his passion, and love for architecture. Firstly, he took issue with Miriam’s statement and talked about Ben, who had created wonderful pieces of woodwork from the resources he had around him, using skill, patience and care. He talked about the tremendous integrity in what he had achieved, and that in Ben’s case, the architecture was much deeper than what he had simply created. He has taken architecture back to its historic roots, and had a strength and purity to it. I couldn’t help be moved and drawn along by Kevin’s eloquent explanation of what made this cottage to special and important. Without passion we have the worst kind of architecture, and the best of it is only created by human energy. Showering praise on all Grand Designers, Kevin thanked all of them for being experimentalists, for taking design to the edge of its margins and for taking risks that others don’t dare. 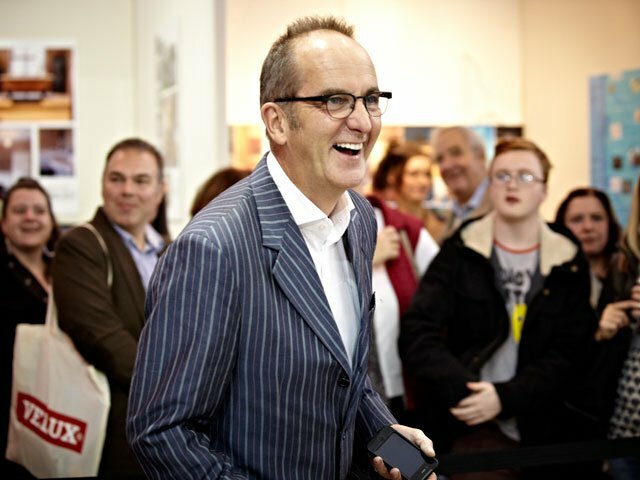 Kevin McCloud will be at the 10th Grand Designs Live, 3-11 May at the Excel, London. The prize is a pair of tickets to Grand Designs Live. There is no cash alternative. The winner will be chosen randomly and contacted by email. The prize will be sent by the PR company. I have Re-tweeted and commented. Thank you to choosing my question to ask Kevin. I’m pleased, and in all honesty, not surprised with his response – I’ve been watching Grand Designs too long to think Kevin is only about design. I also loved Ben’s cottage, especially when they revisited it a few years later to see how things had moved on, it must have been so satisfying to build your own home and then develop it to incorporate your new family! This is a show I really want to see as we have just moved into our dream home an old victorian detatched house which used to be an old parsonage and it has all the period features intact, however it needs redecorating and I am need some serious inspiration as I want to keep it as genuine as possible. I’ve tweeted @unicorndeva Fingers crossed. Pingback: Buying a House: Do You Have Everything Covered? Me too have twitted it @rajkumbh.